February 2018 – Page 75 – Welcome to Wyandotte Daily! 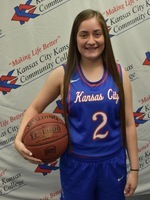 At 5-foot-4 the shortest player on Kansas City Kansas Community College’s women’s basketball team, Gena Ojeda stood tallest in the Lady Blue Devils 75-47 win at Fort Scott Wednesday night. A torrid 5-for-7 from 3-point, Ojeda scored a career high 17 points to help the Blue Devils run their record to 18-5 and 2-1 in Region VI play. The win sets up KCKCC’s toughest test of the season Saturday when the Blue Devils host No. 3 ranked and Jayhawk Conference leader Highland at 2 p.m. Unbeaten in 23 games, the Lady Scotties defeated Hesston 102-51 Wednesday after demolishing No. 4 Johnson County 108-65 last Saturday. A freshman guard from Shawnee Mission Northwest, Ojeda shared game-scoring honors with Lillie Moore, who got the Blue Devils off and running by scoring the game’s first 11 points. Averaging 3.2 points this season, Ojeda became the first Blue Devil outside of Moore, Kisi Young and Nija Collier to lead the scoring. “Gena Ojeda gave us a fantastic effort off the bench,” KCKCC coach Joe McKinstry said. “Fort Scott switched to a zone defense and we struggled to make shots from the perimeter but Gena came in and picked up right where she left on Saturday (12 points). Gena is starting to get more comfortable and it is showing. I’m extremely happy for her as she has had a long recovery from ankle surgery over the summer and she has worked hard to get herself back to the player she’s capable of being. Five Blue Devils scored in double figures. In addition to the 17-point efforts by Ojeda and Moore, Young scored 15, Collier 11 and Ashley Daniels 10. Moore, Collier and guard Caitlyn Stewart had seven rebounds each as KCKCC dominated the boards 46-29. Stewart led in assists with five while Collier had four assists and blocked three shots. KCKCC burst to a 20-12 first quarter lead and Fort Scott never got closer than nine points as a late second quarter surge pushed the Blue Devils to a 40-25 halftime bulge. The Blue Devils took just 54 shots, converting 26 for a crisp 48.1 percent while holding Fort Scott to 16-of-53 for 30.2 percent. KCKCC was also guilty of only 13 turnovers while forcing 17 Fort Scott errors. The win pulled KCKCC into a tie with Johnson County for second behind unbeaten Highland in the Region VI standings. JCCC edged Labette 50-47 in Wednesday’s other action. Northbound I-35 has been closed near Southwest Boulevard since 11:50 p.m. Wednesday because of an accident. Accident cleanup was continuing this morning at the location. According to a Kansas Highway Patrol trooper’s report, a semi pulling two trailers was traveling northbound on I-35 when the driver saw what appeared to be a brown bag in the lane. 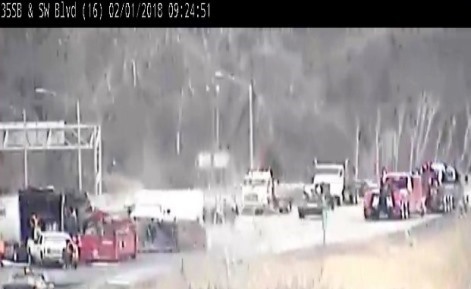 The semi struck the object, and then the driver lost control of the vehicle, hitting the barrier wall several times before the vehicle caught fire, the trooper’s report stated. The driver, a 51-year-old man from Stroud, Oklahoma, was injured and taken to the hospital, the report stated. A strong cold front is moving into the area this morning and will drop temperatures quickly, according to the National Weather Service. Temperatures were 27 degrees at 9 a.m., having already dropped from 43 degrees at 3 a.m., accprding to the weather service. The weather service said temperatures today will be in the 20s, with wind chills in the teens. Light snow will be possible Sunday, and only minor accumulations are expected, according to the weather service. There is a chance for another round of snow on Tuesday. Today, it will be mostly cloudy, then gradually becoming sunny, with a high near 31, the weather service said. A north wind of 11 to 14 will gust as high as 20 mph. Tonight, the low will be around 12 with mostly clear skies, according to the weather service. A north wind of 5 to 9 mph will become light north northeast after midnight. Friday, the high will be near 35, with mostly sunny skies, the weather service said. A light and variable wind will become 5 to 9 mph in the morning. Friday night, the low will be around 29 with mostly cloudy skies, according to the weather service, and a south southwest wind of 8 mph. Saturday, the high will be near 47 with mostly cloudy skies and a south southwest wind of 6 to 10 mph the weather service said. Saturday night, there will be a 30 percent chance of rain, mixing with snow after 10 p.m., then gradually ending, according to the weather service. The low will be around 22. Sunday, there will be a 40 percent chance of snow after noon, with a high near 27, the weather service said. Sunday night, the low will be around 14 with partly cloudy skies, according to the weather service. Monday, the high will be near 38 with partly sunny skies, the weather service said. Monday night, there will be a 30 percent chance of rain before 8 p.m., then a chance of rain and snow between 8 p.m. and 10 p.m., then a chance of snow after 10 p.m., the weather service said. The low will be around 23. Tuesday, there is a 40 percent chance of snow with a high near 34, the weather service said. Tuesday night, the low will be around 16, according to the weather service.